This wedding card is my first card after months of indecision. I started with white card stock 5X6 and I used a layer of yellow then pale green paper (Brides colors) on top of the white with a 1/4" border each. 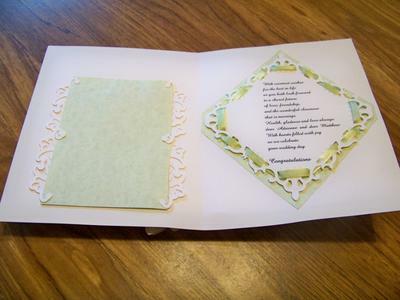 For the left side I used two Spellbinders Perisian Accents with a pale green ribbon running along the seam. For the sentiment I used a large and a medium Fleur De Lis Square one on top of the other with foam spacers. The flower and pearls are from an odd stash of flowers I found in a $1 store. The inside right I threaded the pale green ribbon through the holes in the large die and placed it on the pale green cardstock used on the front of the card. This first project took me about 4 hours SIGH..
Oh! But what a very worthwhile way to spend those four hours .... and the card is just beautiful. 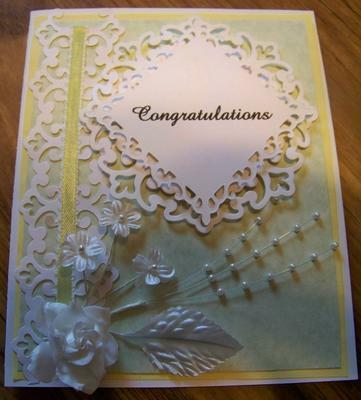 I am sure that the Bride would have been delighted with it and as for us ... well we are just so pleased that you overcame your indecision and made this card ... and then shared it with us in the Gallery. A beautiful card, I am sure it was very well received! Can't wait to see your next creation. So lovely and delicate. I love the Parisian motif dies. Keep showing us more of your gorgeous projects. I love the enamelled roses, too! Very nice, so softly elligant like it. What a beautiful card. I am sure it will be treasured. Join in and write your own page! It's easy to do. How? Simply click here to return to Card Making Gallery.